THIS past summer, I participated in the Pyongyang Project which brought me to the Democratic People’s Republic of Korea (DPRK). The Pyongyang Project, also known as the East West Coalition, is a Canadian non-profit organization that works towards developing a grassroots platform for constructive engagement with DPRK and the Northeast China. In our group, there were ten students from six countries including Denmark, Japan, China, Australia, the US and France. During our two-week trip, we visited five cities in the DPRK. When I reflect on this trip, some key stories loom in my mind. At the very beginning of our trip, we were reminded that it is not allowed to call North Korea “North Korea”. You can only call the country “DPRK”, or just simply Korea. All maps in the DPRK depict the whole Korean peninsula as one country. According to North Koreans, they are Koreans living on the soil of Korea, and the south part of Korea is unfortunately occupied by the puppet government controlled by the imperialist America. Only when you are in DPRK will you feel how deeply the society is influenced by the Suryong System, also known as the Supreme Leader System. Kim Il-sung remains the Great Leader and the head of the DPRK family. His birthday, April 15, is the most important ceremonial day in the country, and the year of his birth (1912) marks the first year of the DPRK calendar. 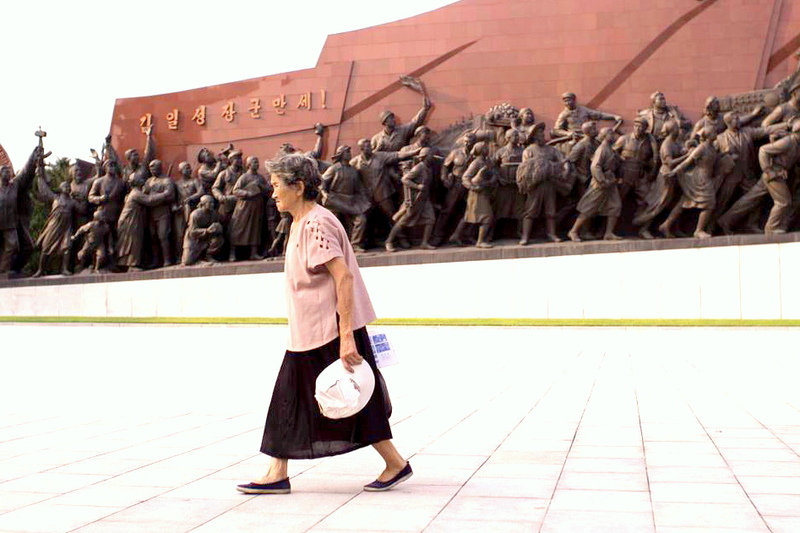 There are approximately 35,000 statues of Kim Il-sung in public squares around the country. Kim Jong-un, the current supreme leader, enjoys the same treatment as his grandfather. Wherever we went in DPRK, we meeded to show respect to the great leader and the supreme leader. We were told to buy flowers, dress properly (no flip flops, hats, sun glasses, etc.) and take a bow. I must include the great leaders’ full bodies when taking photos of their statues. All of our digital devices were under scrutiny when we entered and left the country. The authority wants to make sure nobody takes inappropriate photos during their stay. In the Kumsusan Memorial Palace of the Sun, where the bodies of Kim Il-sung and Kim Jung-il are entombed, I saw many middle-aged women weeping. North Koreans visit the Memorial Palace at least twice a week and during national holidays. Statues in public squares are more frequently visited, and it is a social convention that newly wedded couples pay visit to the statues. When I asked our tour guides where to buy the little pins with the visage of the two great leaders, which every North Korean wears, the tour guide got annoyed and replied, “You don’t buy the pin. You earn it”. Foreigners are not allowed to buy pins with leaders’ portrait. Another interesting fact is that in pictures of the great leaders, there is always a child holding different types of guns ranging from an AK47 to a pistol. “Military first” is such a strongly emphasized policy within the DPRK. When I asked local students in a middle school in Rason what they would like to do in the future, all boys said they wanted to become soldiers, and most girls wanted to marry a military person. The benefit for the military is ubiquitous in the country. Soldiers enjoy priority and can cut queues in the amusement park in Pyongyang. What I saw and heard in DPRK reminded me of China during the Cultural Revolution period. They are alike in many aspects: propaganda slogans and pictures on the streets, people’s enthusiasm for their leaders and people’s negative attitude against the Western world and Japan. North Koreans know little about the outside world, like Chinese people used to be. Our tour guide asked me whether South Korea had a metro. Given the limited information in the country, the Rason Special Economic Zones gave me some hope when I witnessed a basic level of economic freedom. People can trade freely in the market, open a bank account, exchange money under the market rate and even hold a trade fair featuring companies from China and Russia. After two weeks in the DPRK, we returned to Beijing and almost everyone cried out as soon as the airplane landed: “China, the land of freedom”! Compared to North Korea, China is freer indeed. China’s opening up started from economic reforms, and the DPRK is testing a market economy in the Rason Special Economic Zone. It remains too early to tell whether the DPRK has a chance of becoming the second China, but the Rason Zone has kicked off the economic opening up.